The Visionary M10 , 10×50 monocular was the choice for one customer visiting the Northern Optics outlet at Barton Upon Humber. 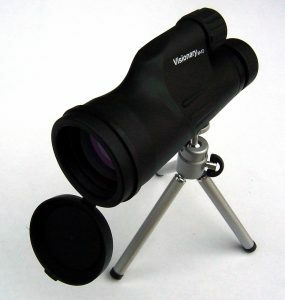 The fully multi-coated optics and bright view gave a great image in low light conditions, when tested. They chose the 10x instead of the 12x due to the wider field of view and longer eye relief. A bonus was the included mini tripod, that can be used as a hand hold to keep steady. Other accessories include lens caps, a cleaning cloth and soft case with belt loop. Handling is very easy with a large focus wheel. Plus being nitrogen waterproof means they can be used in all conditions. This entry was posted in Monocular Reviews and tagged 10x50, monocular, visionary. Bookmark the permalink.